Queen Elizabeth National Park is in southwest Uganda. Leopards roam the Mweya Peninsula, which lies beside Lake Edward. Nearby Lake Katwe is a huge volcanic explosion crater. Boats on the Kazinga Channel float past hippos and Nile crocodiles. Chimpanzees inhabit the Kyambura Gorge. Trails lead to bat caves in the central Maramagambo Forest. The Ishasha area is home to tree-climbing lions and shoebill storks. Interested in visiting Queen Elizabeth National Park? Queen Elizabeth National Park forms part of an extensive system of contiguous protected areas, namely the Kigezi (256km2) and Kyambura (154km2) Wildlife reserve, Kalinzu Forest reserve, and neighboring DRC, the 200km2 Virunga National Park. Rwenzori National Park lies a few kilometers north. The park is home to 95 mammal species while the bird list is 612 species long. This diversity is the result of an impressive range of habitats. Fifty-seven vegetation types have been identified though these can be summarized as just five: forest, grassland, bushy grassland, and Acacia woodland and lake shore/swamp vegetation. 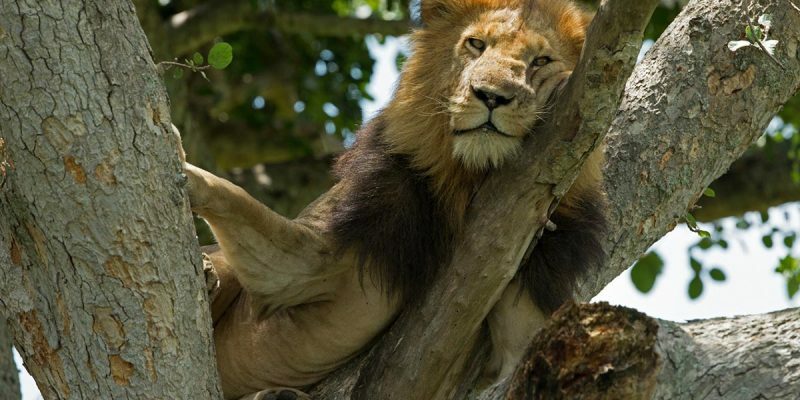 Residents of Queen Elizabeth National Park’s grasslands include elephants, cape buffalo, Uganda kob, water buck, warthog, giant forest hog, lion, leopard and hyena. Topi are found in Ishasha, while forest primates are found in Kyambura gorge and maramagambo forest.